BBQ. That could mean many different things in Vancouver. It can range from Chinese BBQ shops to Korean tabletop BBQ dinners. 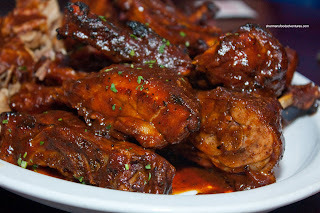 In fact, those would come to mind first over what we normally associate with BBQ in North America. You see, American BBQ, whether it be Texan, St. Louis or Kansas City, is not exactly that prevalent here on the Wet Coast. It is quite possible due the large distance away from the source could be a reason. Maybe it could be the demographics as well. It would explain the plethora of Asian restaurants, which completely dominate the culinary landscape of our city. Whatever the case, this is all we got and we can only do a locational comparison. Comparing to authentic joints in the South would be just plain ludicrous. So Mijune and I went on another eating escapade - this time at Migz BBQ. 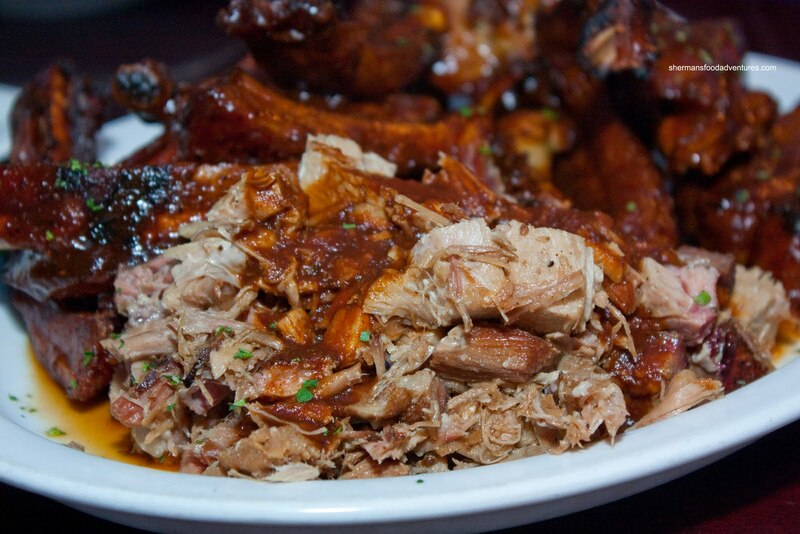 Of all the offerings in the menu, we only had our eye on one - The Pig Out Platter. With a choice of 3 meats and 2 sides, it looked like a good way to sample what they got. 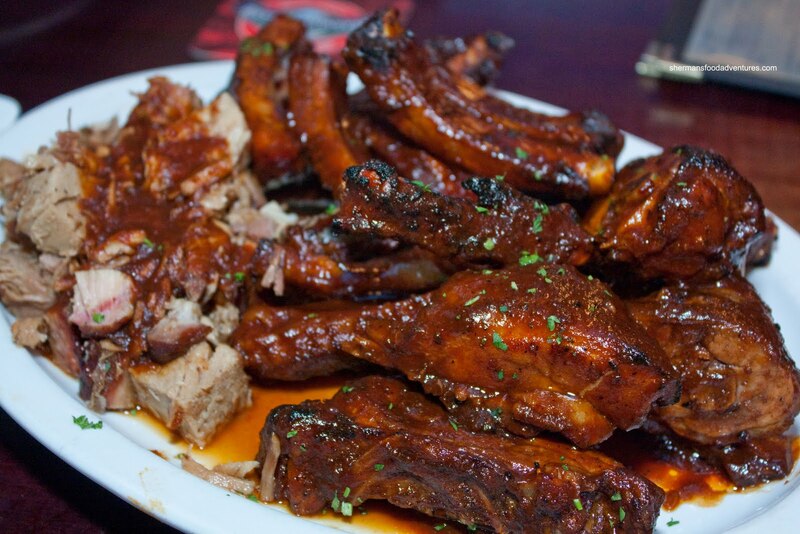 We settled on the Baby Back Ribs, Pulled Pork and Duck. When the food arrived, we were pretty underwhelmed at the portion size. For me, this surely didn't seem like enough to feed 3 people. Moreover, the Pulled Pork looked more like chopped meat. My question is - how hard is it to hand pull the meat? It is pulled pork... Now with that being said, the pork itself was fork tender while just a shade dry. But again, how hard is it to slather it in sauce? With such a meager amount of BBQ sauce, it looked more like boiled meat. To be fair, once we asked for more sauce, the pulled pork was not bad. I would've liked to see a bit less liquid smoke and some more sweetness. Now, by eye-balling the Baby Back Ribs, I knew there would be issues. 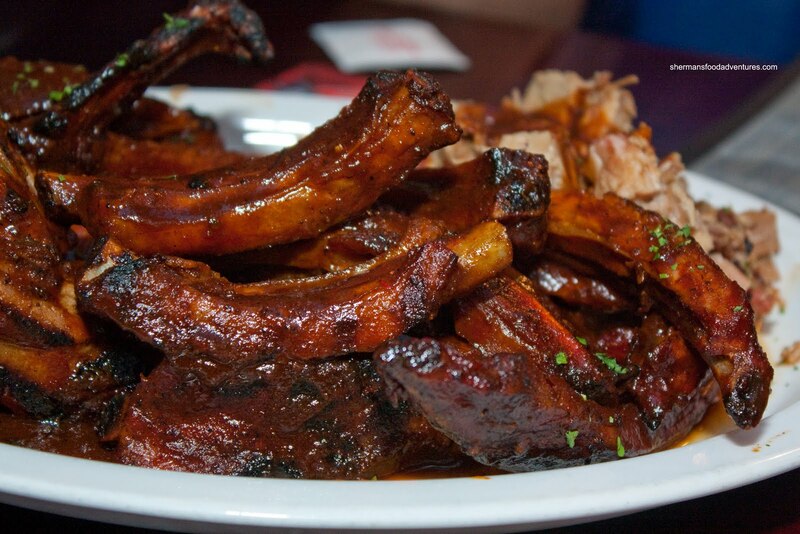 You see, rather than being served as an intact rack of ribs, they were cut up into individual ribs. This practically guarantees that the meat would be dry and all the edges would be hard. I had a total of 4 ribs and the first wasn't too bad; but the rest were very dry and hard. To be fair, as dry and hard as it was, all the meat was still edible. So for those who like their meat this way... For me at least, I found the Duck to be the highlight (it's all relative though...). It was a cross between a Chinese BBQ duck and a smoked duck. The meat was chewy and slightly difficult to break down. However, it was "juicier" than the ribs and it had a nice smokey aroma. I had to pick the skin off though, it was too thick and chewy. 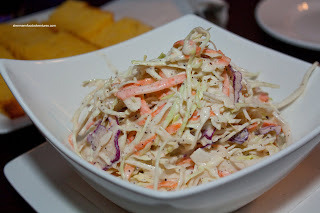 Other than the duck, the other item that I didn't mind was the Coleslaw. It was crunchy, fresh and full of flavour. I found the dressing to have a nice tang; but it was too heavy on the pepper - maybe that's why it had flavour... Although the dressing was creamy, they should've not put so much into the slaw because it became almost soup-like and ultimately watery. It looked like cream soup at the end. 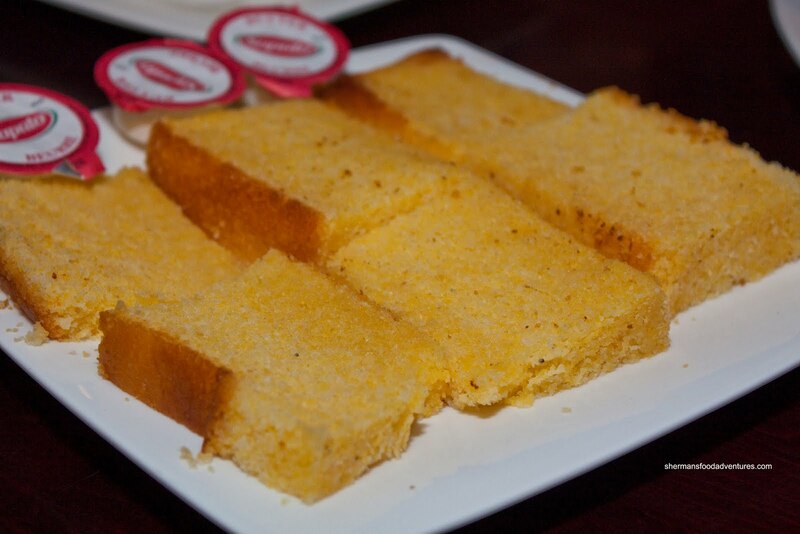 As for the Corn Bread, it was presented in a way that it resembled pound cake. When I picked up the crumbly "cake", it really did feel like I was eating pound cake. It had a wet, dense texture to it and was extremely buttery. I liked how it wasn't too sweet; but there was a noticeable absence of cornmeal. Hence, it didn't have a crunch to it. Not terrible, not good either. 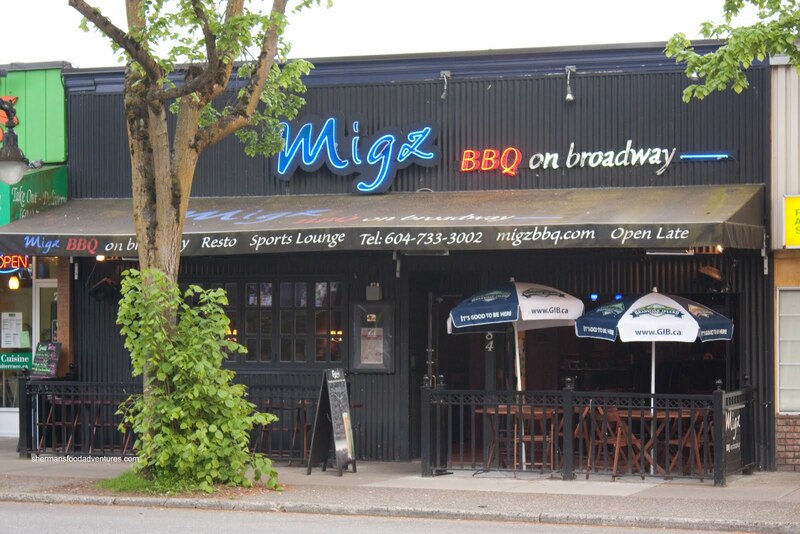 Now, if one was to look at all the comments about the BBQ at Migz, it would appear the food is inedible. Honestly, I wouldn't go as far to declare that. I will say that the BBQ at the Hog Shack, Memphis Blues and even Montana's to be superior. If I had to draw a parallel, the BBQ here most closely resembles BBQues in Yaletown. We didn't get to try any of the other items on the menu, so the jury is still out on that. As for the BBQ items we did try, it is true that there is better elsewhere. I guess with the increasing choices of many different types of food in Vancouver (that is not Asian), restaurants have to up their game in order to compete. Merely serving something that is average will not cut it for most anymore.